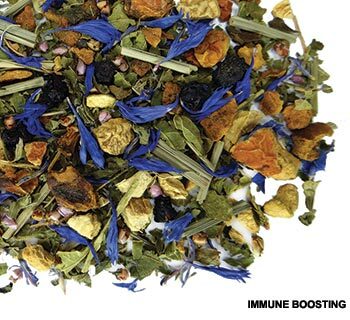 This beautiful green tea blend is full of fruit pieces. The distinct melon-y aroma is punctuated by juicy strawberry. Your first sip is soft, fruity and full of flavor. Sweet notes of strawberry combine nicely with galia melon. You are left with a pleasing and refreshing aftertaste lingering on the palate. This thirst-quenching green tea blend is all about sun-ripened strawberries, with the galia melon and mango adding delightful layers of complexity and fruity sweetness. Enjoy this flavored green tea either hot or iced. This tea is lovely served aside a bowl of fresh fruit for breakfast, or as a snack any time of day. It’s also delicious paired with a cheese platter and crisp seed crackers. 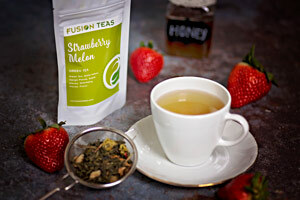 Or, brew Strawberry Melon Green Tea double strength and add it into your next green smoothie! Originally produced in Israel, the galia melon is green in color and tastes like a cross between honeydew and cantaloupe. Like many in the melon family, it is high in vitamins and minerals.